The Welsh Rugby Union (WRU) (Welsh: Undeb Rygbi Cymru) is the governing body of rugby union in the country of Wales, recognised by the sport's international governing body, World Rugby. The roots of the Welsh Rugby Union lay in the creation of the South Wales Football Club in September 1875; formed, "...with the intention of playing matches with the principal clubs in the West of England and the neighbourhood. The rugby rules will be the code adopted." The South Wales Football Club was superseded in 1878 by the South Wales Football Union in an attempt to bring greater regulation to the sport and to select representatives from club sides to represent the international game. The SWFU though were poorly organised, and although they arranged fixtures between a South Wales team and various English clubs, they were often victims of fixture-clashes and were accused of lacking energy. In 1880, Richard Mullock, secretary of the Newport Athletic Club, decided to take matters into his own hands and without the backing of the SWFU organised an international match against England. The match took place on 19 February 1881, and was won by England seven goals, one dropped goal and six tries to nil. This heavy defeat lay the seeds for further reforms that would lead to the creation of the WRU. There is confusion regarding the official date of creation of the Welsh Rugby Union. In March 1880 nine teams supposedly met at the Tenby Hotel, Swansea with the intent of creating a new union. These teams are thought to have been, Cardiff RFC, Chepstow RFC, Haverfordwest RFC, Llandaff RFC, Llanelli RFC, Neath RFC, Newport RFC, Pontypridd RFC and Swansea RFC. The issue with accepting this meeting is that there is no written evidence, just oral repetition. On 12 March 1881, eleven clubs met in the Castle Hotel, Neath to form what would be accepted as a Welsh rugby union. After a humiliating defeat in the first Wales international rugby game, the Neath meeting was organised by Mullock to form a union that could organise regular international matches. The founding clubs of the WFU (Welsh Football Union), as it was originally known, were Swansea C & FC, Pontypool RFC, Newport RFC, Merthyr RFC, Llanelli RFC, Bangor RFC, Brecon RFC, Cardiff RFC, Lampeter RFC, Llandovery RFC and Llandeilo RFC. Strangely the oldest rugby club in Wales, Neath RFC are not recorded as being present, even though the meeting took place in the town of Neath. It is unknown if this was an oversight by the committee to record the presence of the club, or if Neath RFC actually did not attend. The fact that two of the main committee members of the SWFU, John Llewellyn and Sam Clark were Neath men, and the creation of the WFU disbanded their union, is generally accepted as the reason for the absence of a Neath representative. The WRU was a founding member of the International Rugby Football Board, now known as World Rugby, in 1886 with Scotland and Ireland, with Mullock and Horace Lyne the Welsh representatives at the formal signing of the union in 1887. It wasn't until 1934 that the name, the Welsh Rugby Union, was adopted. The WRU are responsible for the running of Welsh rugby, including 320 member clubs, the Welsh national team and National Leagues and Cups. The Welsh Rugby Union has a major role in the development of coaches, referees and players throughout all ages for both men and women. 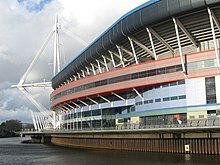 They also own the home of Welsh rugby union, the 74,500 capacity Millennium Stadium, Cardiff, "an icon of the modern Wales". After the national team the next highest level of representation in Wales is the four regions based around top club sides, but representing a larger area. These regions came into being in 2003 when the WRU elected to reduce the current top tier of Welsh professional rugby union from nine clubs into five regions modelled on the successful Irish provinces and the Super Rugby franchises in South Africa, Australia and New Zealand. The WRU had hoped to reduce the teams to four regions but Cardiff and Llanelli successfully argued for stand-alone status. After one year the Celtic Warriors region was closed down and the four surviving regional clubs are Cardiff Blues, Scarlets, Ospreys and Newport Gwent Dragons. They play in the Pro14, European Professional Club Rugby (Champions Cup and Challenge Cup) and Anglo-Welsh Cup competitions. Each region may call up players from a set of club teams within their area. These top club sides play in the 14-strong Welsh Premier Division. In August 2008 WRU chief Roger Lewis confirmed that the body was looking at a proposal to reinstate a fifth Welsh region, based in North Wales. Lewis admitted that he regretted the decision in 2004 to close down Celtic Warriors. In September 2008 a new North Wales Rugby development team was announced, likely to be based in Wrexham; ultimately, the team was launched as RGC 1404, and was to be based in Colwyn Bay instead of Wrexham. In the same month Llanelli Scarlets changed their name to simply Scarlets, believing the new name would better represent their region beyond Llanelli. The current Rugby Services Agreement (or RSA) has been in place since 28 August 2014, and will be in place between the union and the four Welsh regions (Cardiff Blues, Newport Gwent Dragons, Ospreys and Scarlets) for six years. The RSA delivers £8.7million a year to the Regions guaranteed to be spent on Welsh qualified players with a complex matrix of funding, also guaranteeing a further £3.6million in loan facilities from the WRU repayable during the term of the RSA. Each Region also receives a one-off £500,000 payment on signature of the new RSA. The new agreement also allows players to be offered a National Dual Contract (NDC), which means the union will pay 60% of a NDC player's salary and their region 40%. They also become available for all Welsh senior matches, despite if the match falls outside World Rugby's international release windows in June and November. The WRU retained the right to play up to 13 senior international games each year with a 13-day release facility for squad training before the Six Nations and Autumn series games. The new agreement does state that the national team head coach, currently Warren Gatland, will be the sole person to decide who gets a National Dual Contract, with a long-term aim of only selecting players based in Wales. The limit on foreign players in Regional squads has been capped at a maximum of six while each Region will be allowed two so-called time serving players who will be available for Welsh selection after three years residency (rising to five years, effective from 31 December 2020). The union's patron is Elizabeth II, and her grandson Prince William became the Vice Royal Patron of the Welsh Rugby Union as of February 2007. ^ "Governing Bodies of Sport-Sports Council for Wales". Sport Wales Chwaraeon Cymru website. Sport Wales. 2007. Archived from the original on 15 October 2008. Retrieved 26 July 2009. ^ Smith (1980), pg 34–40. ^ Smith (1980), pg 37. ^ Smith (1980), pg 41. ^ Smith (1980), pg 42–43. ^ Smith (1980), pg 45. ^ "WRU: History of the Welsh Rugby Union: A Brief History". Welsh Rugby Union website. Welsh Rugby Union. 2009. Archived from the original on 3 August 2011. Retrieved 16 July 2009. ^ "WRU:Structure of the Welsh Rugby Union:Board of Millennium Stadium plc". Welsh Rugby Union website. Welsh Rugby Union. 2009. Retrieved 16 July 2009. ^ "WRU considers north Wales region". BBC News. 15 August 2008. ^ "WRU plan for northern development team". The Independent. London. 9 September 2008. ^ "Scarlets drop Llanelli from name". BBC News. 11 September 2008. ^ "Prince William WRU's vice patron". The BBC. 31 August 2006. Retrieved 29 October 2007.